With the February 2012 passage of the Results Based Budgeting Act, the Alberta provincial government signaled its intent to change how government services are funded and evaluated. Results based budgeting (RBB) is a form of performance management that proponents claim helps make sure that public services are provided efficiently and effectively. Ensuring that citizens benefit from well-run public services is unquestionably a chief responsibility of government. Different levels of government from around the world and across the political spectrum employ various strategies in an effort to ensure the efficiency and effectiveness of the services they provide. The pretense of unbiased objectivity: results derived from the application of techniques like RBB are presented as beyond debate, which can serve to disguise the need for ongoing critical engagement with public policy issues by both policy-makers and the public. The challenge of measurement: public services are multifarious and interconnected, making them ill-suited to evaluation through techniques such as RBB. Increased administrative burden and higher costs: intense scrutiny of public services requires resources that might otherwise have helped fund the services themselves. Failure to bring about meaningful change: resource-intensive efforts at performance management have often failed to significantly alter how public services are funded and evaluated. Within Alberta, the provincial government embraced performance management in the 1990s under the premiership of Ralph Klein. The results of Klein-era efforts underline the potential of performance management techniques to substantially increase bureaucracy, which can erode government effectiveness and efficiency. Current government employees experiencing the RBB process firsthand have expressed serious concerns about the process. Ultimately, performance management techniques such as RBB have a dubious record both internationally and within Alberta. In Alberta, RBB amounts to an attempt to justify a longstanding political agenda. Rather than a dramatic change in budgeting practices, it reflects the commitment of the government to further diminish the role of government through both increased privatization and cuts to public services. This is evident within the RBB process, both insofar as the government has made clear it expects savings, and insofar as private sector advocates have been given influential roles. 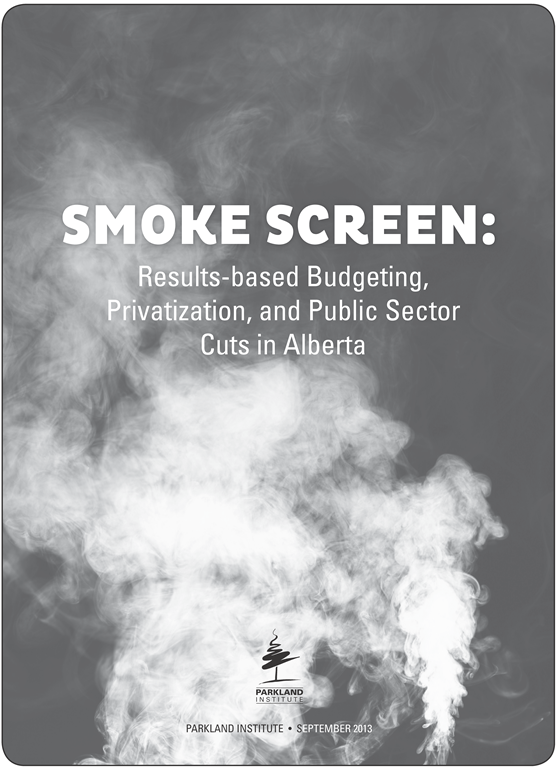 Privatization of Alberta’s public services has been shown to erode their quality and accessibility, as well as to reduce government transparency and accountability. RBB appears to be the smoke screen Redford’s provincial government is using to shroud its plans to shrink the role of government. A more appropriate effort to ensure effectiveness and efficiency in Alberta’s public sector would involve determining how to get maximum value for citizens through the delivery of accessible, high-quality public services. Such an effort would require a commitment on behalf of government to work cooperatively with public sector employees, community groups, and Albertans to determine which services are necessary, and then to establish a provincial revenue stream adequate to cover the costs. Ensure adequate staff, funding, and time for the RBB process, in order to allow for careful and robust assessments of government functions. Ensure that RBB, or any other performance management process, fully utilizes all resources internal to the civil service, and reconsider the involvement of private sector advocates such as the Centre for Priority Based Budgeting. Commit to making public all key documents relating to the RBB process, including draft review plans, finalized review plans, and any feedback provided by Challenge Panels. Photo credit: William Warby under a Creative Commons licence.